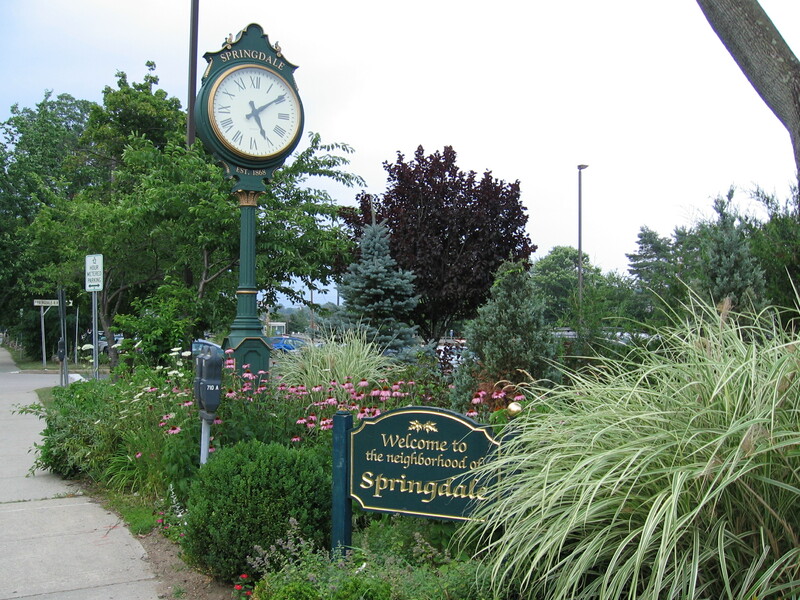 Springdale is known for its distinctive character & convenience offering a small town feel with walkable streets and a bustling commercial strip with stores, restaurants, a movie theater & a Metro-North station, and a more spread out, suburban feel as you head north to the New Canaan border. This tranquil Stamford suburb offers variety of housing options from mid-century houses to townhomes, garden style condominiums and rental apartments. Springdale is in the midst of a small rejuvenation in the central village area with new buildings and redefinition of the streetscapes. Under construction. One of two 1/4 acre lots subdivision. Great opportunity to live in a quiet family neighborhood in the Springdale section of Stamford CT. Modern colonial with 3,100 square feet of open layout design. 4 bedrooms, living room, dining room, family room, chef's kitchen with eating area, 3 1/2 baths, 2 sided fireplace, large patio, 2 car garage. Walk-up attic and walk out lower level can be finished for additional living space or in-law situation. Walking distance to train station, schools, shops and minutes drive to major highways. Spacious Springdale Colonial set on beautiful half ( cul -de-sac) acre near the New Canaan Border . Open 2 Story foyer. Newer granite Eat-in Kitchen w/ Breakfast area, SS Appliances & Pantry has sliders to deck. Family Room with Fireplace, Formal Dining Room and Formal Living Room with French Door opens to the Large Deck too. First Floor also come with Powder Room, Laundry, Mud Room & 2 Car Garage with interior access. Lovely 2nd Floor come with 4 good size Bedrooms, Bonus Room & 2 updated, bright, tiled Bathrooms. The huge MBR Suite with large Walk-In Closet. The Master Bath w/ Separate spacious. Shower & Whirlpool Tub. The large Bonus Rm could be Office or Library. Huge Walk out & Tiled Lower Level (sliders) has lots of built-in closets and storage, could be Game Room or Exercise Room. Full Walkup Attic for additional storage. Newer Roof (2012). Gas Heat/ Central Air. Public Water/Sewer. Lots of great space in this home! Spectacular New England Colonial on New Canaan Border. Privately set on level 1.37 park-like acre. Professionally Landscaped w/ heated In-ground Pool, Playground and wrap around Deck. Open Floor Plan w/ ample sunlight. Large EIK that boasts new Granite counters, Backsplash, Center Island with grill top, High End Appliances, including Double Oven. Newly renovated Living Room w/ Marble FP, Crown Moldings, and Oak Hardwood Floors. First Floor BR with Full Bath could be used as a 2nd Master BR or In-law suite. Oversized Family Room featuring Custom Bar w/ wet bar and Refrigerater, Sun Room with Vaulted Ceilings and sky lights. The Master BR offers Walk in closet, 2 additional closets, Dressing room, generous Master Bath and sitting room w/ wet bar. Large deck off of Master with beautiful views of the Backyard. Newer Roof, Deck, Insulated Double-Pane Windows, Freshly Painted, 2 attics provide tons of storage, Large Garage w/ Workshop. Master Craftsmanship throughout the house , High End materials, Crown Moldings, many built-ins, and Closet systems. NEW Furnace. Close to Merritt Parkway, Train Station, Restaurants and shops. Agent/Owner related. Upper Springdale gem! This custom-built tudor home is ready and waiting for you to just place your furniture. This home is sun-filled and set beautifully on highly sought after cul-de-sac. Offering 4/5 bedrooms, 3 full and 2 half bathrooms plus open floor plan including magnificent and dramatic wall of glass in the living room. A rare and exceptional family home only minutes to shopping, schools, recreation and more. An appealing home offering convenience and comfort in one Springdale's most desirable settings. On this quiet cul-de-sac the house sits back from the road for added privacy. Ideal area for biking, jogging or a brisk walk. The home features several complementary rooms to accommodate an active lifestyle. An open-spaced living room leads to a 50-foot front porch suitable for morning coffee. The heart of the home is the large remodeled kitchen w/ dining area, cherry cabinets, stainless appliances, quartz counters & bar-stool station. Dining room, walled with glass, overlooks a Japanese garden. Master suite w/vaulted ceiling, skylights, custom WIC, balcony, & luxurious bath. LL has fire-lit family room and a rare, street-level, in-law suite. Spectacular recreation studio with 12-foot ceiling, built-in sound and screen, and elevated picture windows. Music/sound studio w/acoustic panels, could serve as home theatre. studio, indoor golf station or an inspiration lab. Rounding out the lower level is a fabulous music/sound studio with 10-foot ceiling and completed with acoustic absorption panels. Amenities include a natural gas fired generator, security system, hardwood flooring, walk-in attic, and high efficiency HVAC. Note some photos are virtually staged. Land is .48 acres and backs up to a wooded bird lover's sanctuary. The fenced back yard will keep your exploring pets in, and the inquisitive deer out. There are many stations of interest throughout the low-maintenance grounds. WOW! Rare Opportunity in Stamford/Springdale Area! Spacious 3 Family home currently set up as 4 Units. All Units in great condition, 3 Units offer 2 Bedrooms and 1 Unit offers 1 Bedroom. Tons of parking space in rear. Conveniently located to shops, parks, train, public transportation and much more! This home sits on 0.48 acres in the Private Overbrook Drive Association and was renovated in 2014. In pristine condition it boasts 4 bedrooms, 3 1/2 baths and a fireplace in the living room. An in-law or nanny suite with a private entrance is on the lower level with a deck overlooking the rear yard. There is also a deck off the kitchen. Convenient to Downtown and has city services of water, sewers, trash collection and snowplowing. Great investment opportunity to own legal three family house, a little TLC and interior updates will make this multi family shine. First floor unit has 3 bedrooms, 1.5 baths, laundry in unit. Second floor has 2 bedroom, 1 bath apartment and another 1 bedroom, 1 bath apartment. There is a 2 car garage with attached laundry and storage space and additional driveway parking. Apartments have separate utilities. All units currently rented, rents are below market rate. Sale As Is. Please watch out for pets when showing. Listed by and of Troy Real Estate, Inc.
Springdale listing alert! This colonial craftsmen is full of character, functionality and warmth. The home features oak hardwood floors throughout and a wood-burning fireplace. The main floor is surrounded by windows. The sun-drenched kitchen has two large islands finished with black granite. Stainless steel appliances and a natural gas cook top make this a great chef's kitchen. French doors open from the dinning room to the expansive (26x22) newly repainted wood deck making this a great home for entertaining. The Master suite is a real retreat with a lovely updated master bath and a walk-up to a bonus room with his & her closets, a built-in bookcase and office space. The upstairs includes two more bedrooms and a full bathroom. The basement is finished with a full bath, large laundry room, lots of hidden storage and access to the paved driveway. The fenced in half acre of land has lots of usable, secluded yard space and gives the home a country-like setting. A magnolia tree, lilacs and rose bushes accentuate the large and peaceful outdoor area of the property. There is a 3-car, 2 story detached garage with a large storage room in back that could be used as a workshop or art studio. The house is conveniently located to within a mile of restaurants, bars and shopping in the heart of Springdale and gets you easy access to the Metro North line, with direct routes to Grand Central, a great value for NYC commuters. Come take a look at all this home has to offer. This move-in-ready 4 bed/4 full bath colonial home truly feels like Home when you step through the front door. It features warm Brazilian cherry hardwood floors, open-concept living spaces, a huge level fenced backyard, a finished lower level, and an elevator. The main level includes a living room with gas fireplace, full marble bath with tub, formal but open dining room with french doors, and open concept family room/kitchen. The recently updated white kitchen has a stainless gas range, subzero refrigerator, wall oven & microwave, new cabinetry, oversized farm sink, and Carrera marble counters. The second floor is accessible by elevator, and you will find the master suite plus three spacious bedrooms and a full hall marble bath with shower, bidet, and double sinks. The master suite has a balcony overlooking the backyard, huge walk-in closet with built-in shelving, marble master bath with separate shower and soaking tub, and double sinks. The finished basement features a living/play area, kitchenette, full slate stone bathroom, separate laundry and entrance, and two bonus finished rooms with brand new carpet. Location is everything on Mulberry Street - quiet dead end street, close to the train, Springdale restaurants, schools, and minutes from vibrant downtown Stamford!